If you like playing Shaper, you will love playing this card. It makes your basic run on R&D three times more effective. 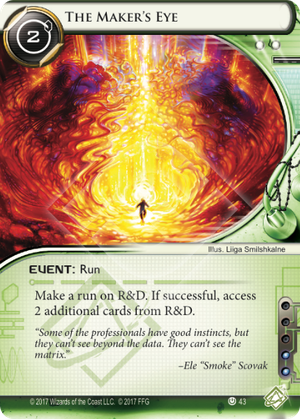 The probability of scoring three agendas in one run is fairly low, but you will get one of the most important things in Netrunner: information. R&D Interface - the number of cards sum up, so you can acces 4, 5 or 6 cards in one run with three RDI installed Indexing - first you run to see what's in the R&D and put cards in such order you can get to everything you want with The Maker's Eye. But remember corporation can shuffle their deck with cards like Jackson Howard Medium - Insanity. In theory, if corp allows you to, you can access many cards with Medium, RDI and TME, but in most cases you will pick either RDI or Medium. Everytime you will want to make deck around R&D access, you will come back to this card. And sometimes you can use it to suprise corp, the same way why you could include Legwork. But remember - accesing many cards at once against Jinteki trap decks is not always good idea! One of the best deadlock-breaking run events in the game, and one of the main reasons why R&D is an ICE priority against Shaper. At 2 influence, this can see play in other factions, especially with a couple Same Old Thangs, and it's worth a shot if you want to save up for one high-power run that you know you'll succeed in. With an agenda density of roughly 10/45, you've got about a 66% shot at finding one (boy I hope I remember how probability works)! If you can't break into a tough remote, this event gives you a shot to even the scoring window. Find Prisec before it installs! Delete the mighty Jackson and stop recursion in its tracks! Run into a Snare and strongly consider your choices in the IG meta. It's rarely a card that will be a dead draw after you get a few breakers and econ out, and for that reason I often have one or two in my Shaper decks. Also, the foresight on the flavor text is nuts. They mention Smoke several years before she comes out! Wonder what else is down the pike for new IDs on old cards?